The City of Welland offers many advertising and sponsorship opportunities to help promote your business or event. In addition to information about specific opportunities below, the City has partnered with Comcast Spectacor Inc. to offer a wide range of opportunities. View our presentation to see what is available. The City reserves the right to restrict sponsorships and/or advertising to certain services and to exclude any products and industries at its discretion. Sponsorships and/or advertising will not be accepted from any party that portrays, promotes, or condones the stereotyping of any group or discrimination as defined in the Ontario Human Rights Code or which is contrary to the Canadian Charter of Rights and Freedoms. Sponsorship rights and/or advertisements will not be accepted if they unnecessarily promote the commercialization of public space. Reserve your space today! 905-732-2414. Discover Welland has a circulation of 20,000 and is distributed across Ontario. 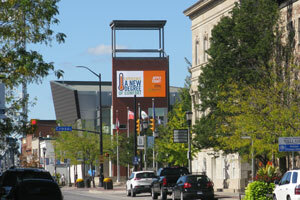 Discover Welland holds audience to potential tourists who are interested in discovering our amazing City. Reserve your space today! Email advertise@welland.ca. The City of Welland presents opportunities for advertising at the 2,500 Main Spectator and the Youth Arenas. A unique and cost effective branding opportunity awaits the local business community by securing a prime advertising campaign. A variety of signage allows your company to optimize a great return on investment! Advertise your business so all of Welland Residents can see. 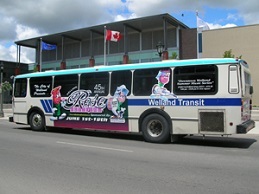 You could also advertise within the bus, so all riders can remember your ad. The Wellness For All financial assistance program relies on generous donations from community groups, local businesses and individuals to operate successfully. All donations are matched dollar for dollar by the City of Welland. City Events-Summer Music Festival, Canada Day and New Years’ Eve Bash are just a few of our City Events. You could also sponsor Summer Camp or book some ice for FREE Skating, the possibilities are endless to help out our community. If you are interested in being a sponsor or a vendor, please email recreation@welland.ca.